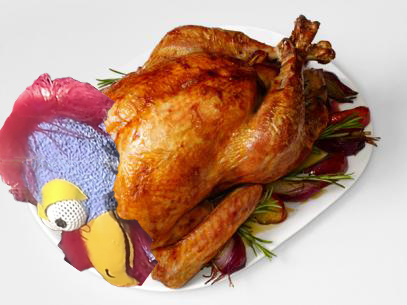 Headlies: Braun Strowman Invites The Gobbledy Gooker To Thanksgiving - WrestleCrap - The Very Worst of Pro Wrestling! Houston, TX – After competing in the traditional 5-on-5 Survivor Series Elimination Match, Braun Strowman invited WWE legend the Gobbledy Gooker to Thanksgiving. Over the past few years, the two have struck up an unlikely friendship as the Gooker has taken Strowman under his wings in a mentoring role. “For how long?” asked the Gobbledy Gooker. “Oh, roughly about 15 minutes per pound,” said Strowman, licking his lips. 3 Responses to "Headlies: Braun Strowman Invites The Gobbledy Gooker To Thanksgiving"
This is why I come to Wrestlecrap. To laugh. Bravo! Well done sir! Encore! Encore! Maybe Terry Taylor can come over for some Rooster surprise. I’m not a chicken, you’re a turkey.